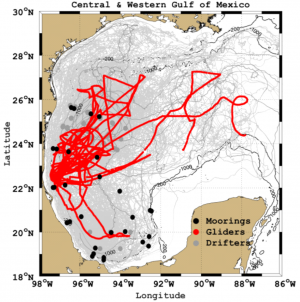 Figure 1 CANEK mooring positions and GMOG glider & GIOLA drifter trajectories from different projects between 2007-18. The Western Gulf of Mexico (WGoM) has been continuously monitored by the CANEK group from the Centro de Investigación Científica y de Educación Superior de Ensenada (CICESE) since 2007 to the present using more than 30 heavily instrumented moorings. The main objective has been to provide the knowledge of the physical processes modulating the regional circulation and the statistics of currents thanks to a contract with the Mexican Oil Company PEMEX. These measurements are key ingredients for the oil industry for the design of structures in order to prevent oil spill accidents, and to reduce the environmental impact of the exploration and exploitation of hydrocarbons. Nearly a decade later, in 2016, the “Grupo de Monitoreo Oceanográfico con Gliders” GMOG (Ocean Monitoring Group with Gliders, in English) was created in CICESE as a response to the needs to gather near-real time data and improve the spatial resolution of the Eulerian sampling using autonomous underwater vehicles. Today, GMOG operates a fleet of 7 Seaglider© providing high-resolution data between the surface and 1000m depth in the central and WGoM. At the same time, also at CICESE, the “Grupo de Investigación en Observaciones Lagrangianas” GIOLA (Lagrangian Observations Research Group, in English) was formed to merge the experience acquired throughout more than 10 years in drifter data gathering within the southern and central parts of the WGoM and the analysis of such data. All groups, CANEK, GMOG and GIOLA, have been working together to investigate the dynamics of one of the key features that drives the circulation in the GoM, i.e., the Loop Current Eddies (LCEs) that, in an aperiodic sense, detach from the Loop Current (LC) and translate always with a westward component. LCEs are coherent structures confined mostly within the upper 1000m and extending order hundred km wide. Even though the energetic currents occur in the upper 1000m, the coupling with deeper layers is an important topic. The water source of these huge blobs is warm and salty Caribbean waters, and are thought to play an important role transporting distinct properties and matter into the western part of the basin. The LCEs interact with the surrounding waters as they transit through the gulf but maintain somehow their identity. Most of these LCEs appear to finally dissipate when they interact with the topography of the WGoM, although their demise may first involve several eddy splitting and merging. Their total life span, considering as birth the detachment from the LC, is on the order of a year. Strong coupling between the upper and deep layers in the WGoM driven by the arrival of the LCEs to the western region has been reported by the CANEK group. This important result encouraged GMOG group to explore deeper than 1000m and recently has acquired a Seaglider© M6 which operates, collecting data, up to 6000m deep. The impact of the continuous and intensive sampling with CANEK’s moorings, GMOG’s gliders and GIOLA’s drifters is evidenced in Figure 1; contributing actively to improve the state of knowledge of the GoM and providing insights into the physical processes driving the regional circulation in the WGoM. CANEK, GMOG and GIOLA groups have been working throughout the PEMEX-CICESE and CIGoM projects, the latter funded by the Hydrocarbon Trust of the National Council of Science and Technology (CONACyT) and the Mexican Ministry of Energy (SENER). *This article is provided by Miguel Tenreiro, Physical Oceanography Department, CICESE.